← 454 "The Color Yellow"
"Congratulations. You're officially a sociopath." "Hey, at least I'm on a path." "Postcards from the Wedge" is the fourteenth episode of season 21. It originally aired on March 14, 2010. The episode was written by Brian Kelley and directed by Mark Kirkland. 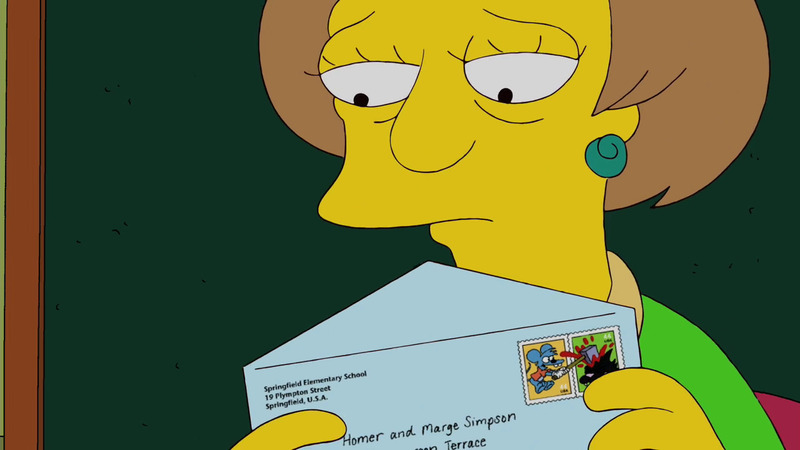 "When Homer receives a letter from Edna Krabappel saying that Bart is way behind in his studies, he tries to take a hard line with him, but Marge thinks he has too much work, so Bart finds a way to turn their difference of opinion into a full-blown fight, only for it to end up with the two of them deciding that they need to worry about themselves more than Bart – at least until Bart discovers that running trains on the old Springfield Subway is causing the school's structure to crumble." Homer and Marge receive a letter from Edna Krabappel informing them that Bart is one month behind on his homework, despite Bart's best efforts to stop them from receiving it. Homer, in an unusually strict act not only wants Bart to do all his homework, he wants him to do more than was given to him and refuses to let him take even a small break until it's done (provided he doesn't have to help). Marge, however, is concerned that the heavy workload will have a negative effect on Bart's enthusiasm for education in general. 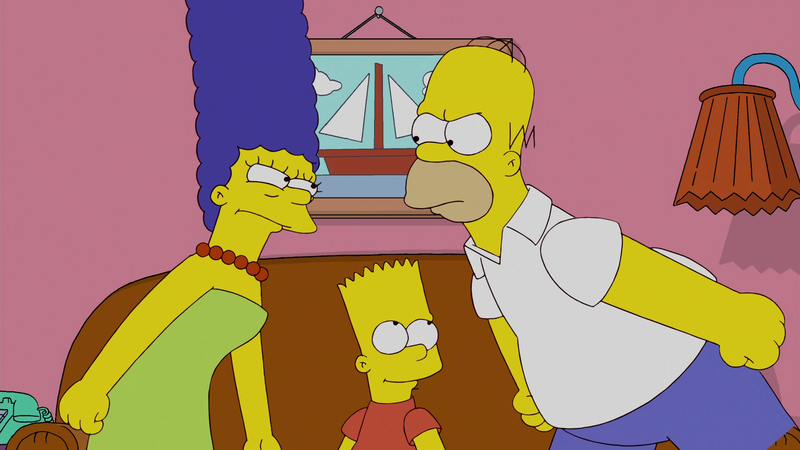 When Bart realizes his parent's opposing viewpoints, he uses it to avoid homework entirely. Lisa explains that homework is a wedge issue, an issue that sharply divides two parties who may otherwise agree on most things. Marge and Homer begin to argue more and more even about things that don't involve Bart's homework, as Bart manipulates them against each other. Marge seeks council from Ned Flanders, who recalls having a minor argument with Maude about their handtowels on the day she died, saying it has haunted him every day since. Marge consults Selma and Patty, who encourage Marge to stick to her guns, even if the issue would endanger Marge's marriage, prompting Marge to relent and leave to apologize. Meanwhile, Homer falls asleep at work, and dreams that he wins the fight and the town celebrates with a parade. But the float he is riding accidentally runs over Marge and kills her. Homer wakes up and realizes that he too wants to apologize. The two spot each other in traffic, rush out of their vehicles and embrace. They then decide to let Bart fend for himself. Meanwhile, Bart and Milhouse play a prank on Principal Skinner. To evade capture by Skinner, Bart and Milhouse hide in the abandoned Springfield Subway System where they discover the subway trains still work. They race down the tracks and cause a seismic tremor to shake the town, like its first run. Homer and Marge fail to react to this, having decided not to let Bart get between them. Bart confesses to Nelson that he no longer feels a thrill when he plays a prank. Nelson suggests Bart receives no gratification from pranks unless someone gets angry. Bart decides to destroy Springfield Elementary, which was damaged by the first subway run, by driving the train under it. Homer and Marge find a note from Lisa informing them of this prank and they decide to stop ignoring Bart. They rush to the subway station, where Homer pulls the emergency kill switch (after picturing Bart's head on the lever and saying,"Why you little...!"). Bart is grounded but is happy that his parents are paying attention to him once more. At the end, Lisa reveals that Bart forged the note about the subway prank, suggesting that he wanted to be caught but promising to keep it secret to protect his bad-boy reputation.